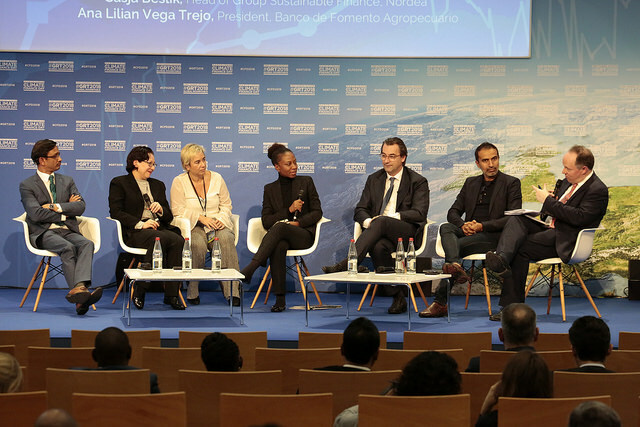 The crowd numbered 650 on the second day of UNEP FI’s Global Roundtable 2018 in Paris, one of the world’s largest gatherings of banks, insurers and investors that are working to put the Sustainable Development Goals at the heart of their business strategy. Delegates discussed the ongoing issues that keep sustainable finance professionals busy, learnt about innovative approaches to environmental and social challenges, and took inspiration from keynotes from leading practitioners. Bell ringing ceremony to open the financial markets hosted at Palais Brongniart by Euronext, and with Eric Forest, Head of Listing France for Euronext, Philippe Zaouati, Chair of Finance for Tomorrow and CEO of Mirova, Martin Skancke, Chair of the PRI, Eric Usher, Head of UNEP FI, and Satya Tripathi, Assistant Secretary-General and Head of the New York Office of the United Nations Environment. A keynote from Eric Usher emphasising the critical role of financial institutions in enabling the economic transitions we need to achieve the UN Sustainable Development Goals. BNP Paribas, Munich Re, CICERO and Rabobank discussing the pioneering work going on around the industry to implement the recommendations of the Task Force on Climate-related Financial Disclosures, what has been revealed so far, and ultimately what the TCFD can deliver. Watch the opening of the session here. Rachel Melson, UK/Europe Director, Tobacco Free Portfolios and Brandee McHale, Director, Corporate Citizenship, Citi; President, Citi Foundation and GSC Chair, UNEP FI sharing their experiences of the challenges of taking a more responsible approach. The Next Frontier for Investor Duties was explored by David Rouch from Freshfields Bruckhaus Deringer, Hanzo van Beusekom, Dutch Authority for the Financial Markets (AFM), Puja Jain from Generation Investment Management and Gerard Fehrenbach from PGGM. They asked how to raise expectations for investors to align with climate and sustainability objectives. The scientific evidence of Hothouse Earth presented by Beatrice Crona, Academy Program on Global Economic Dynamics and the Biosphere, The Royal Swedish Academy of Sciences, Daniella Carreira, Principles for Responsible Investment, Sylvia Wisniwski, Finance in Motion, Sylvain Goupille, Mirova Natural Capital and Althelia Funds. The launch of a new information exchange, the UNEP FI Energy Efficiency Finance Platform, which will allow financial institutions to share leading practices on financing energy efficiency. The new platform was made public at the session discussing the progress and innovations being made toward a low-carbon buildings sector including a debate on green tagging. At the ‘Managing both sides of the house: ESG integration in the insurance industry’ session the French Federation of Insurers announced that they are becoming a supporting institution of the UNEP FI Principles for Sustainable Insurance. Luxembourg for Finance’s Tom Théobald talked about the future of sustainable finance and the Luxembourg Sustainable Finance Roadmap, launched recently with UNEP FI, and announced that the next UNEP FI Europe Regional Roundtable will take place in Luxembourg in November 2018 in partnership with Luxembourg for Finance and the Global Landscapes Forum. Jean Lemierre, Chairman of the Board of Directors, of BNP Paribas closed the event with his keynote speech which echoed many of the messages of the two days of conference: the vital role of the finance sector in sustainable development. “The ecological transition can only succeed if three factors are taken into account: respect for the planet, balance between different regions, and attention to people”. For a summary of the events on Day 1, click here. Watch this space for news about our Regional Roundtables 2019, coming soon!